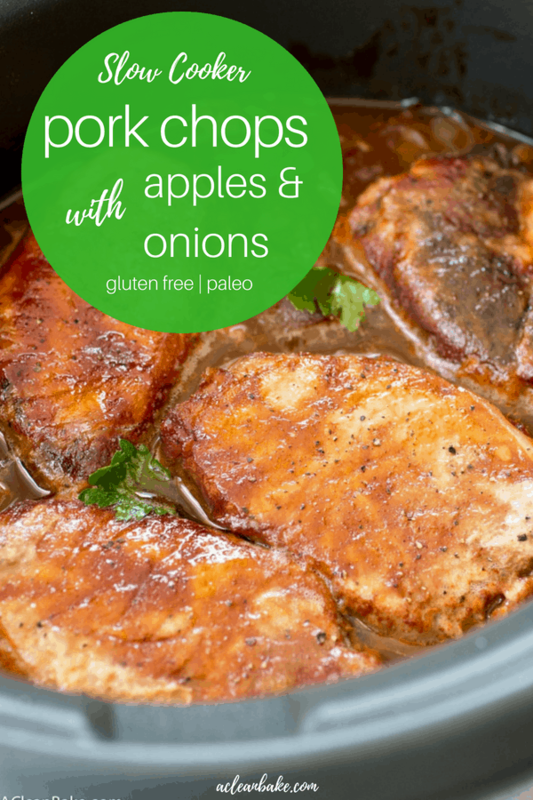 Crockpot Pork Chops with Barbecue Sauce, Apples and Onions. This recipe is mostly hands-off cooking time and is healthy too! Perfect for weeknight dinners. It’s freezing. And it’s only going to get worse. There’s never a better time to break out the warm, hearty dishes than that first day that you feel the cold in your bones in a way that makes you feel like you’ll never get warm (and you won’t, until next July at least). I am trying to stay warm by moving around a lot. Our house has never been cleaner (yet, simultaneously, dirtier, which I know sounds like an oxymoron but, trust me, it’s possible) and I managed to channel my freezing energy into about 100 pictures of this deceptively simple dish. Sorry for the visual overload. I might have taken one million pictures for my own enjoyment (and body temperature) but I made this dish for my husband, who is such a good sport about eating chicken night after night that I like to make him a different kind of meat once in awhile, even though I am terrible at cooking basically anything besides chicken or fish. 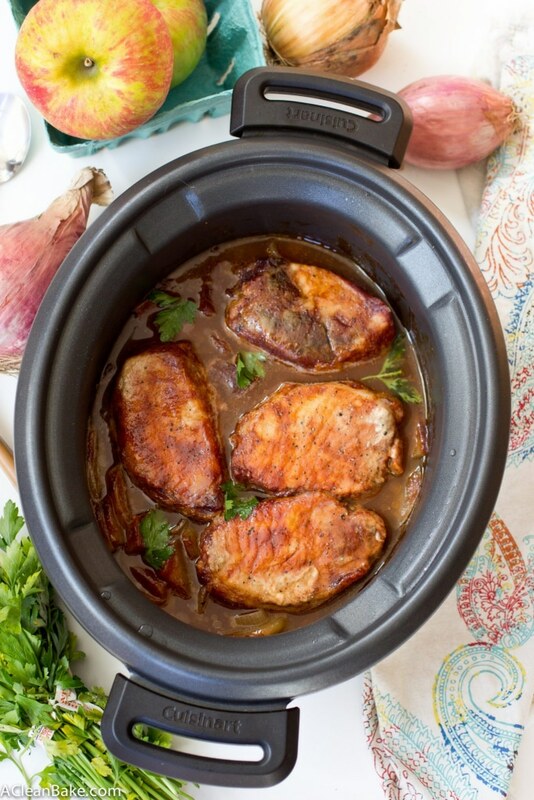 Luckily, the slow cooker does most of the cooking for you in this recipe, and all you have to do is a little chopping, stirring and pouring and then sit back and wait for your oblong personal chef to do the work for you. We received the slow cooker as a wedding shower gift a little over a year ago, but it’s been only recently that I have really put it to good use – partly out of necessity, but also because the more I use it, the more I realize how versatile it is. In this case, it is a one-pot meal wonder, and this recipe makes several servings so you can easily set yourself up with a few meals, or a quick family-sized supper. I used thick cup pork chops (from Costco), so if you use thinner ones, you’ll want to reduce the baking time accordingly. My guess would be that you’ll only need an hour and change instead of the full two hours of cooking time. Don’t forget that you can easily make your own barbecue sauce for this! You can use whatever barbecue sauce you want, but if you are using homemade and it is not as thick as bottled stuff, you may want to reduce the water by a Tablespoon or so. If you’re sensitive to high sugar fruits (such as if you’re on a candida cleanse or the SCD diet), you can swap in green apples (ok for candida, not ok for SCD) or red bell peppers. (Though, be aware that BBQ sauce is not going to be low-sugar). I have tried this with both onions and shallots and you can’t really tell the difference in the end, so use whatever you have on hand. Ok, enough talk, let’s eat! Ratatouille, which makes a great side dish for this meal! 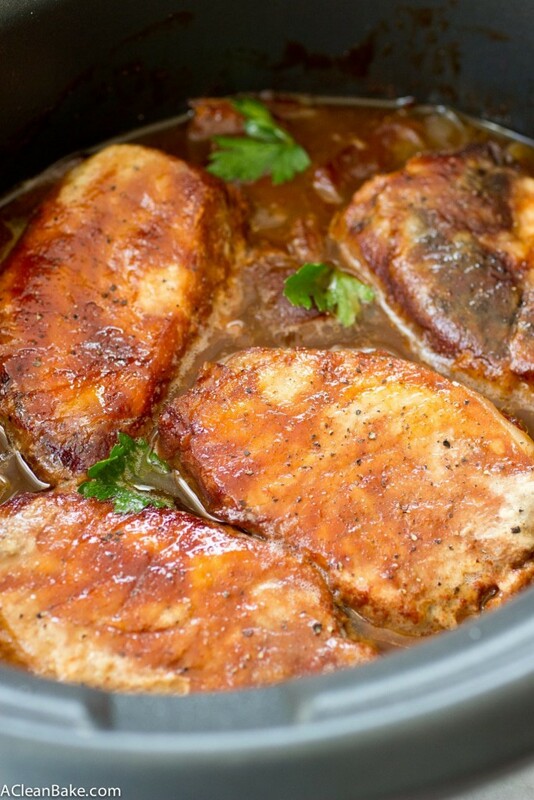 Crockpot rice, in case you need a quick carb to pair these pork chops with. Homemade barbecue sauce to use in this recipe. Slow cooker pulled pork, for next week’s meal plan! 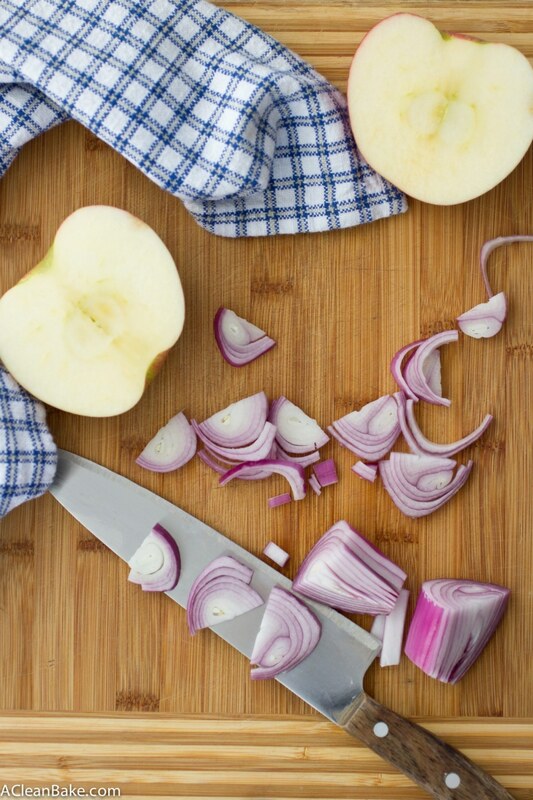 Thinly slice your apples and onions and transfer them to the bowl of a 4 quart crockpot with a high heat setting. Toss them together gently to combine and spread the mixture to cover the base of the bowl. 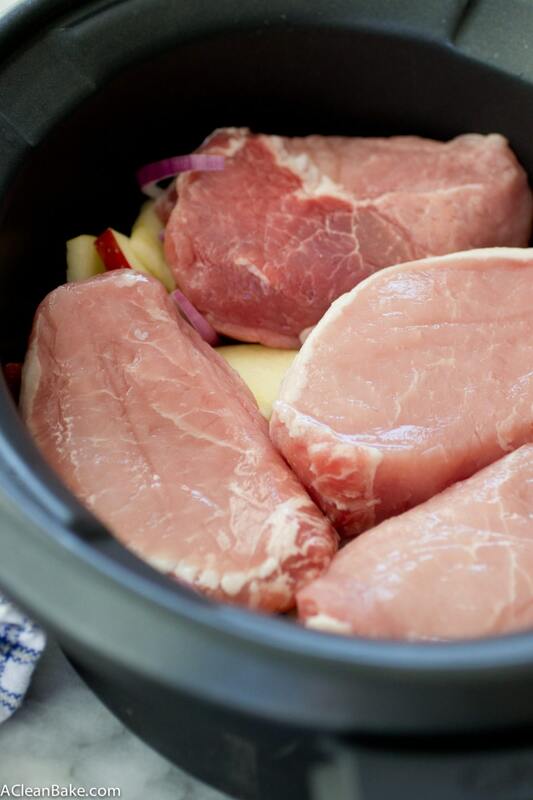 Place the pork chops on top of the apple and onion mixture, spacing them evenly apart from one another. In a small bowl, whisk together the barbecue sauce and water. Pour the runny sauce over the pork chops, making sure each one is evenly coated. Cover and cook on high for 2 hours or until the juices run clear. I used thick cup pork chops (from Costco), so if you use thinner ones, you’ll want to reduce the baking time accordingly. Depending on the size of your chops, you'll probably only need high heat for about 1 hour, or low heat for 90 min-to-2 hours. If you're making your own BBQ sauce, omit the sugar, molasses, or maple syrup (depending on the recipe) for Whole30 compliance. My boyfriend would absolutely love this!! I can’t wait to make it for him. That’s great! I hope he likes it! Thank you so much! If you do make it, let me know what you think! I LOVE CHOPS OF ANY KIND I HAVE TO TRY THIS. Ohh you got me with that first picture — I’m suddenly very acutely aware of how hungry I am…Totally a plus that it’s a crockpot recipe! (: Hope you’re keeping warm; have some hot cider for the fall! Ah, my evil plan worked! 😉 Hope you’re staying warm too! if you put the crock on law, how long can it cook for without ruining the chops? To be honest, I haven’t tried it enough on low to give you a perfect answer, but I think doubling the time would be a good place to start (that may not be enough time, but it’s easier to check it after 4-6 hours and add more time than cook it too long and ruin it!). Since this is a relatively lower-fat cut of meat, it’s tricky to balance cooking it long enough to make it safe to eat with drying it out terribly. Sorry I don’t have a clearer answer for you. It’s really best to cook it on high if your crockpot has that setting! Can you sub something else for the bbq sauce? Hi Rosie, unfortunately, the BBQ sauce is the source of most of the flavor and a lot of the moisture in the recipe. You might try apple juice or cider but I’d also recommend adding some spices (perhaps the spices that are called for in the bbq sauce recipe, though in smaller quantities!) to make sure the dish isn’t too bland. Fair warning though: I have not tried this with apple juice or cider so I can’t promise the results! Would adding an hour for frozen pork chops be long enough do you think? I just found this recipe and it looks incredible! I want to make it tonight! Hi TaRysa! To be honest, I can’t say for sure, but I think 45-60 additional minutes should be a good amount of time to compensate for using chops straight from the freezer. 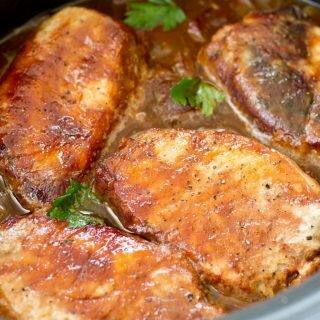 HOWEVER – sorry to be a party pooper – I feel obligated to at least mention that it is not recommended that you use meat straight from teh freezer because it spends too much time at “spoiling temperature” (More info here: http://www.thekitchn.com/can-you-cook-frozen-meat-in-a-slow-cooker-good-questions-218843). If you do it all the time and you’re comfortable with it, then by all means, go for it! But I wouldn’t feel like a responsible recipe resource if I didn’t at least mention it! 🙂 Let me know how it goes! Do you add any salt or pepper or any other seasonings to this? The picture of the pork chops looks like they have pepper on them aND also some parsley thrown in. Typically, your BBQ sauce should have enough flavor that you won’t need any extra seasoning unless you want it. I like to keep the recipes as simple and straightforward as possible, so pepper and parsley for garnish is not necessary, but you can definitely add it if you want to! Do you peal the apples? I’ve tried it both ways. If you want to peel them, you certainly can, but I typically don’t anymore to save time. Is it really only 2 hours?? I’m headed to the store right now! Can’t believe I forgot to respond! I was in a food coma. This is a great recipe! Making it again tonight! Have it in the crockpot cooking right now, will let you know how or goes. Looks really yummy. Yes please! I hope you enjoyed it! Do you have an estimate on the calorie count for each serving? Hi Miranda, I just added the nutritional info to this recipe. 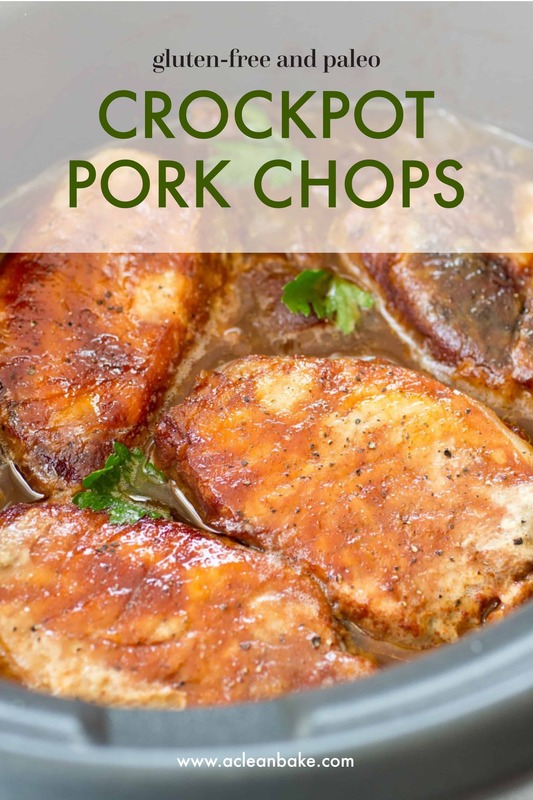 I used VERY large and thick chops, so the recipe produces 4 servings at about 600 calories/serving. However, about 450-500 cals per serving is attributable to the chop, so if you’re using smaller or thinner cuts, please adjust the nutritional info accordingly. I hope that helps! What would you recommend to serve with this? Hi Sarah! In my house, we tend to keep weeknight meals pretty simple with a protein and a vegetable. I like a hearty winter salad with this dish. Maybe something like this: https://acleanbake.com/roasted-carrot-salad/, and if you’d like a starch too, some roasted potatoes or sweet potatoes with rosemary and olive oil would round out the meal very nicely! This was very delicious and easy! Loved how it was short cooking time and once put in the crock pot I didn’t have to do anything else. Def. Adding into our rotation. Do you think you could cook this on low? Our crock pot tends to burn/dry out things (runs really hot). If I can cook on low, how long would you guesstimate cook time? Thank you! Hi Megan! Yes, you most likely could. I don’t know for exactly how long but I’d guess 3.5-4 hours, then check it to see if it’s done or needs a little more time. Sorry I can’t tell you exactly! If you do work it out, can you let me know how much cooking time (on low) was best? Thanks! 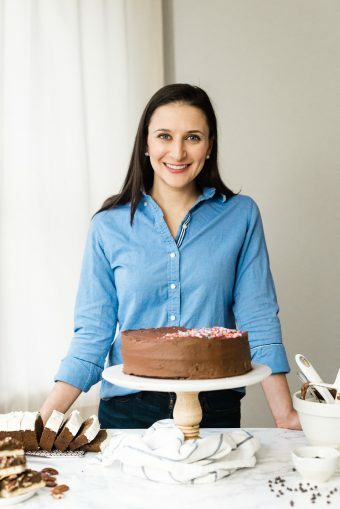 How do I print this recipe, the instructions, and the nutritional information, and maybe a couple of pictures in a PDF format to save to my computer? If I try to print up everthing I get ads in all the wrong places blocking the recipe and/or the instructions. Help?? Hi Bill! I would not recommend printing this page, which is why you are getting all the ads. Please scroll to the recipe card and use the “Print” button which will generate a clean, print-friendly version of the recipe in a new tab of your browser. It also contains a picture! Unfortunately it does not include the nutritional info – sorry about that. Please let me know if you’re still having trouble! is it still two hours if i double it? It will depend on the size of your chops and the machine you are using. I would recommend starting with 2 hours and adding more time as necessary, rather than risking your meal getting dried out! Same time for a 6qt crockpot? Thanks! Yes, it should be approximately the same amount of time, but I would start at 90 minutes just to be on the safe side (with more room for air to circulate, the chops might cook a tiny bit faster). Will this recipe be okay to serve with Quinoa? I made this Whole30 compliant so made my own BBQ sauce which tasted NOTHING like real BBQ sauce which to me is a bit spicy and smoky. So the recipe for me turned out a bit bland, but I am sure if you used regular BBQ sauce it would be much more flavorful. The meat was tender and the apples/onion combo was really yummy. There is no salt or pepper mentioned in the recipe but I added it, as well as some herbs at the end to give it some color and a bit more flavor. Hi Kirsten! Thanks for sharing your experience! In the future, you can use the homemade BBQ sauce recipe that is linked in the post, and just leave out the maple syrup for Whole30 compliance. The reason there is no salt and pepper in the recipes is because all of the seasoning and flavor is supposed to come from the BBQ sauce. But feel free to season to your preference! These turned out great! Thank you for the recipe.